Just write. If you hit a wall in your brain and no words are coming out, just write the first thing that comes to mind and see where that takes you. Write a sudden, unexpected event that interrupts the scene, and have your characters struggle to get back to what they were doing, only to be interrupted again. Think about adding conflict, then think about solving that conflict. It doesn't matter if anyone is ever going to think that the words you've written are important to them. Just make it important to yourself to finish. 2. Dedicate time to it. Unless you're blazing fast, writing 1,666 words will probably take at least an hour of steady typing. If you take time to think about the next few sentences or paragraphs before you put them down, it will likely take a couple hours or more. And that number only applies if you're writing every single day! No weekends or holidays off. 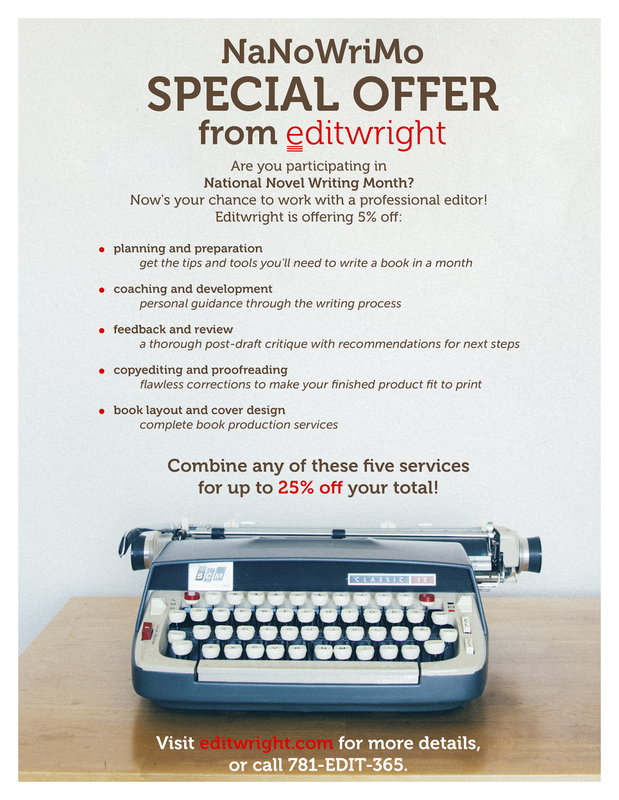 If you want to make it a Monday-through-Friday deal, you're raising that bar to 2,500 words per day. Good luck. Here's a protip: Make it something you do at the beginning of every day. No, I know you heard me say "something you start at the beginning of the day," but I mean start and finish. Get rid of as many distractions as you can, ignore all the rest without a second thought, and don't stop working until you finish. If you have to, get up an hour early every day in November, then resume your old sleep habit in December. Novels don't just conveniently steal time where they can in your schedule. You have to sacrifice your own time to the gods of writing, who will often repay you with writer's block, just so they can have a good chuckle at your expense. If that happens, start sacrificing your time to yourself instead, and ignore the gods, too. I don't mean to be the glass-is-half-full person, but... it is. And it doesn't do any good to argue about it. If the clock chimes at midnight on December 1 and you've just finished writing your 49,000th word, you won't have lost anything. You won't get kicked out of any clubs or disqualified from any contests. You're not the weakest link. You pretty much met the goal. That's good enough. Heck, even if you mostly fail in your commitments to NaNoWriMo in November, you don't have to stop writing on December 1. However much you wrote, look back at your month and find out what worked for you. If you realize, for example, that you only really got any writing done on the weekends, maybe weekends will continue to be a good time for you to write throughout the rest of the year. If you were only able to crank out 500 words per day, now you know what a realistic pace is for you, and you know it will only take you a little more than three months to write a 50,000-word novel. That's still pretty good. NaNoWriMo has a huge support community. Use their forums and connect with your local writing community and bookstores to find out who's organizing NaNoWriMo events and meetings. 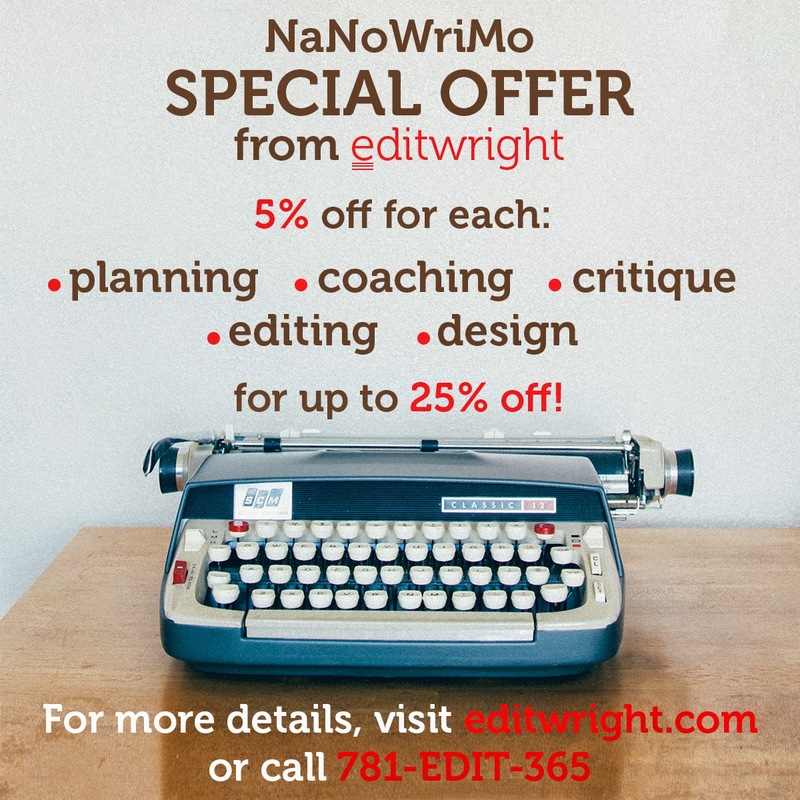 For questions about NaNoWriMo, or to talk about planning, preparation, coaching, feedback, critique, editing, proofreading, or design services related to NaNoWriMo, visit our contact page to send an email or call 781-EDIT-365.